It was during an extended visit to Mannheim in 1777 that Mozart became friendly with the oboist Friedrich Ramm, a member of the famous Mannheim orchestra which was widely acknowledged as the finest in Europe (‘an army of generals’ as Charles Burney remarked). Earlier the same year Mozart had composed his Oboe Concerto, and impressed by Ramm’s ability, he now played the work through to him on the piano. Although Mozart had written it for another player, Ramm was to make it his own: by 14 February 1778 he had performed it no less than five times – ‘a great sensation…Ramm’s cheval de bataille’ as Mozart described it. Mozart later found occasion to compose especially for Ramm – the Oboe Quartet was written as a celebration of his virtuosity, and significantly challenged the boundaries of the possible on the contemporary oboe. As principal oboist of the Royal Concertgebouw Orchestra, and an international soloist in his own right, Alexei Ogrintchouk may well be said to be the Friedrich Ramm of our day – also on BIS, his performances of J.S. Bach’s oboe concertos was judged to be ‘as astonishing as it is successful’ on the web site klassik-heute.de, with a sound described as ‘generous, rounded, warm and velvety’ in Classica. He here performs these pillars of the oboe repertoire with the support of the renowned Lithuanian Chamber Orchestra in the concerto and in the company of three highly respected young string players in the quartet. 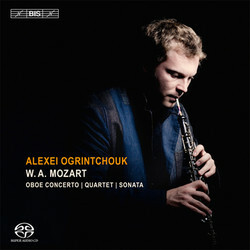 To round off the programme Alexei has called in his father, the pianist Leonid Ogrintchouk, and together the two perform a transcription of the Violin Sonata in B flat major, K 378, composed during the same period as the two other works on this disc.